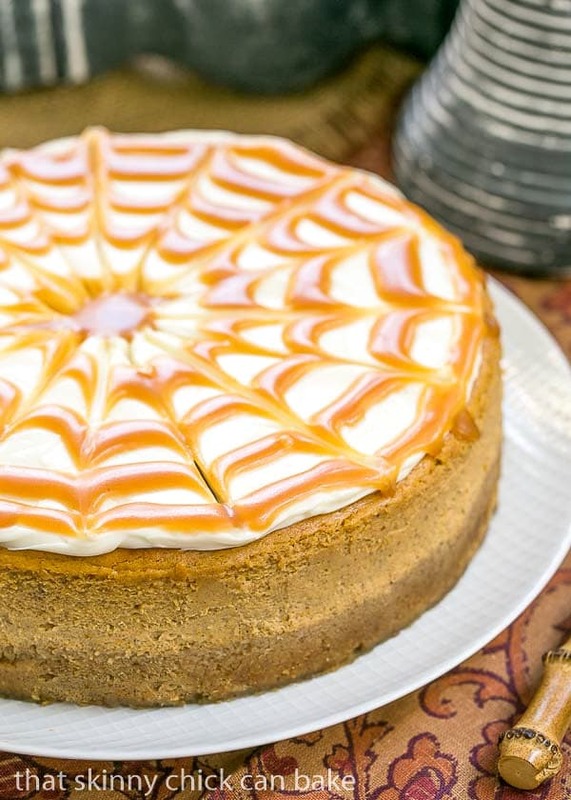 Pumpkin cheesecake is the perfect autumn indulgence! This creamy, dreamy spiced homemade cheesecake with a swirl of caramel is the best cheesecake for Fall! The picky hubby is a huge fan of the classic pumpkin pie. It’s a must make for Thanksgiving. But no tweaking allowed. Pumpkin chiffon pie is a no go and, heaven forbid, no substitutions like this outrageously delicious pumpkin cheesecake. He also won’t touch pumpkin bread, pumpkin fudge or any other pumpkin delicacy. Well, it’s his loss. Though I really don’t get his logic, I was A-OK with more of this dessert for me. I’d never used this combination before, but drizzling caramel sauce over pumpkin cheesecake turned out to be one stupendous idea! You could drizzle and swirl or just pour some caramel sauce over the top of each slice. But I piped a spiral of caramel over the cream cheese topping, then used a skewer to make this starburst design. I’m not too artsy, so don’t worry, this is an easy technique. 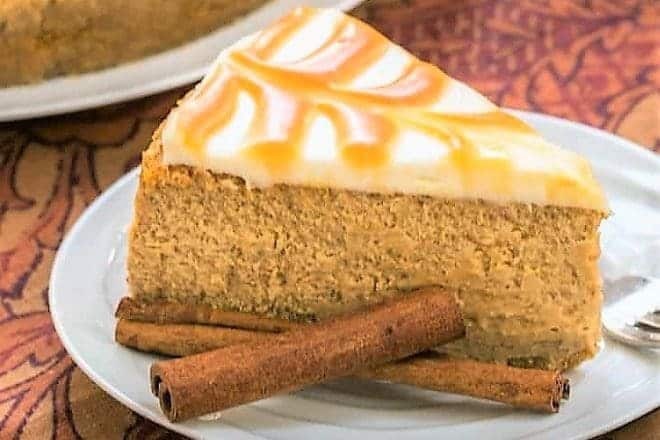 I’ve made pumpkin cheesecakes before, but this one trumps any previous versions. The texture is light and luscious, and oh, so creamy. I’d pick a slice of this beauty over pumpkin pie every time! Preheat oven to 350°. Wrap base of a 9-inch springform pan with 2¾-inch sides with a double layer of heavy duty (or regular) foil. Set aside. Mix together graham cracker crumbs and brown sugar. Add melted butter and mix until combined. Press crust mixture onto bottom and up about 1 inch along the side of the pan. Using a stand mixer fit with the paddle attachment, beat cream cheese and sugar until light. Reserve ¾ cup of the mixture to use as the topping (cover and chill). Add pumpkin, 4 tablespoons whipping cream, cinnamon, allspice and vanilla to the pumpkin mixture and mix until well combined. Add eggs 1 at a time, beating just until combined. Pour filling into the crust. Make a water bath by pouring boiling water into a large roaster to about an inch up the sides of the pan, and place in heated oven. Place well-wrapped springform pan filled with cheesecake batter into the roaster. Bake until cheesecake moves only slightly when the pan is shaken, about 1 hour 15 minutes. 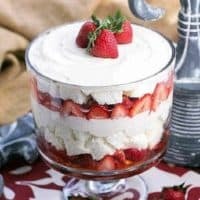 Transfer cheesecake to rack and cool 10 minutes. Run a knife around the perimeter of the pan to loosen Cool. Cover tightly and refrigerate overnight. Release pan sides from cheesecake. Bring remaining ¾ cup cream cheese mixture to room temperature. Add remaining 5 tablespoons whipping cream to cream cheese mixture and stir to combine. Pour cream cheese mixture over cheesecake, spreading evenly. Drizzle with caramel sauce or using a ziplock bag with a hole cut in the corner, starting at the center, pipe a spiral from the middle to the edges. Take a skewer and draw “spokes” from the center to the edge to make a web-like pattern. Looks terrific! I think your hubby is very Lucky !! This is a beautiful cheesecake especially the topping with the caramel spider’s web! This looks utterly delicious Liz. I must make this – and with caramel topping? What a perfect Autumnal treat! Pumpkin and caramel sounds like a fantastic combination! The swirl on top is gorgeous! Absolutely divine looking cheesecake. I am not a fan of pumpkin pie. I love anything else pumpkin and with caramel it is irresistible. Looks so creamy.. and the caramel on top looks just amazing! This looks simply glorious, Liz. 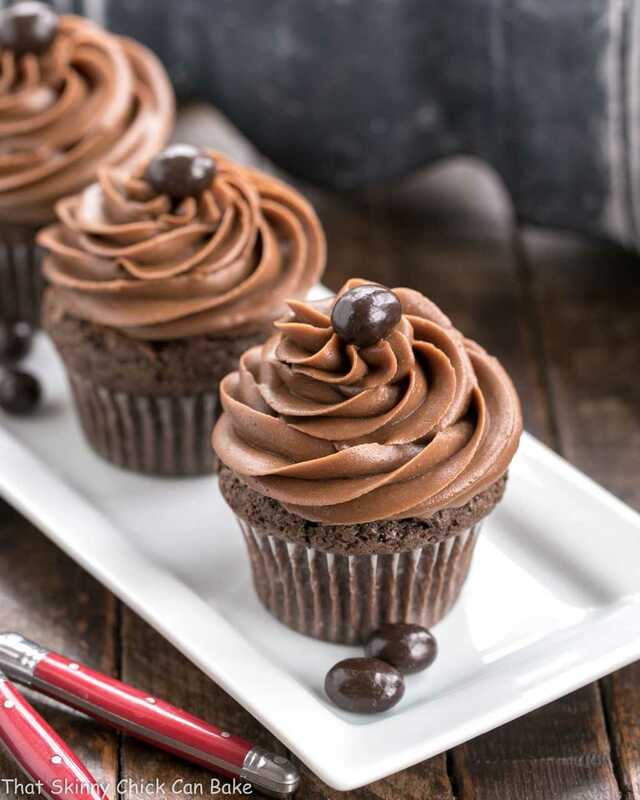 Love that beautifully done swirls atop. This looks so good, great way to use pumpkin. Such a sublime cheesecake, Liz! I’ve been obsessed with all things caramel and pumpkin this fall, so this is calling my name! What a stunning pumpkin cheesecake – I love the design. This would be perfect for the holidays! I adore cheesecake!!! My family can’t have dairy… but I can. Would it be wrong to make a cake all for me and eat it in front of them??? 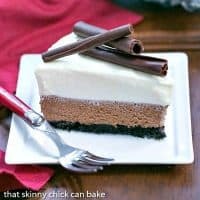 Cheesecake is my absolute favorite and I love that gorgeous caramel topping! This looks beautiful! I think I’m going to make it and eat it!!! Pumpkin and caramel? Nope, I haven’t had it either. But now that I know about it, I want it. I WANT it! 🙂 This sounds delish — really creative. And gorgeous, too. Thank you! Wow, Liz, this has to be the ultimate pumpkin dessert if I’ve ever seen it! The caramel on top is perfect! Hi Liz, this sounds and looks delicious, love the swirl on top. This cheesecake is such a showstopper, Liz! I love the beautiful swirls! 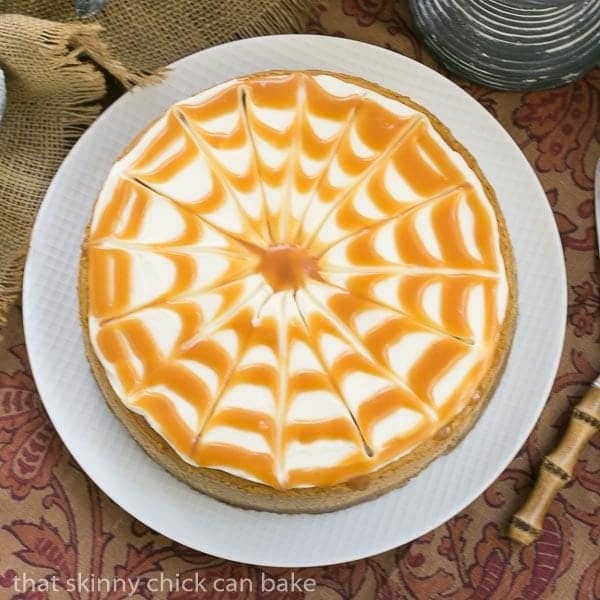 Ooooo, you make the spiral design look and sound so easy….Tempted to try this magnificent holiday treat à la the always gourmet Skinny Chick! This is really a very beautiful cake! 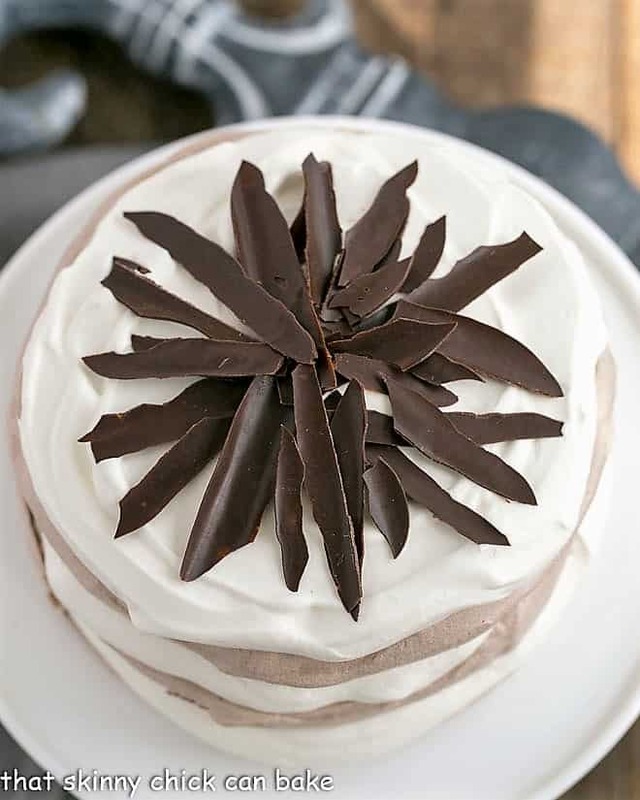 Fantastic job on the swirl and feel free to send leftovers this way when you make this again! Pumpkin cheesecake is my mom’s favorite. I’ve never even had it. I need to make this, though I don’t think my decorations will turn out as well as yours. Gorgeous cheesecake! My hubby will only eat my pumpkin bread, no pie or anything else. Funny how they get so picky. Absolutely gorgeous, Liz! Seriously. And I’d be fine with more for me too, but my husband would be all over this one! Stunning! 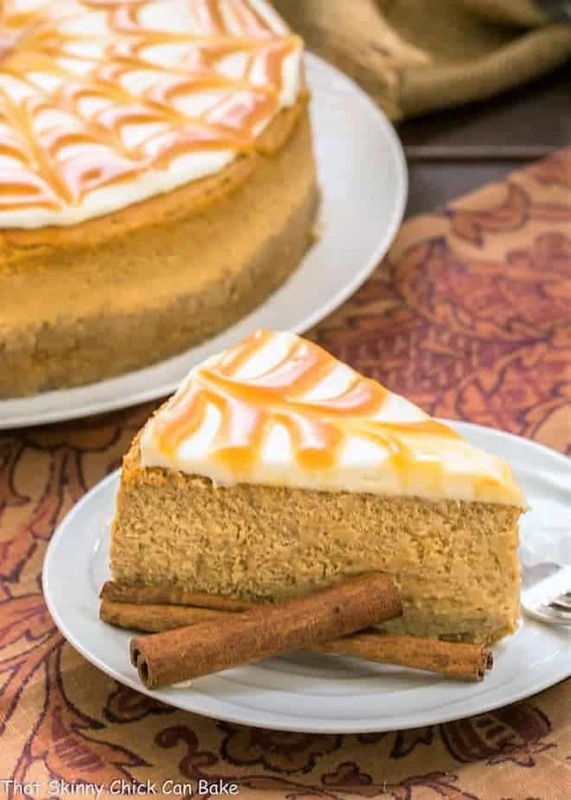 I am addicted to pumpkin cheesecake, it’s the combination of two amazing flavors, pumpkin and cheesecake. Your cheesecake looks perfect Liz. 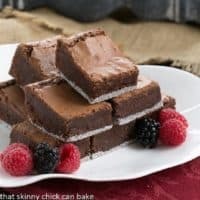 This would be the perfect Thanksgiving dessert- so rich and delicious! Much better than pumpkin pie! Beautiful webbing on top. Caramel and pumpkin is such a good combo. I cannot wait to try this! What a delicious flavor combination! 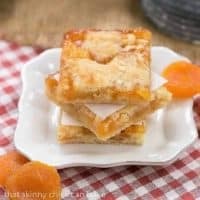 This will be a great dessert for Thanksgiving! 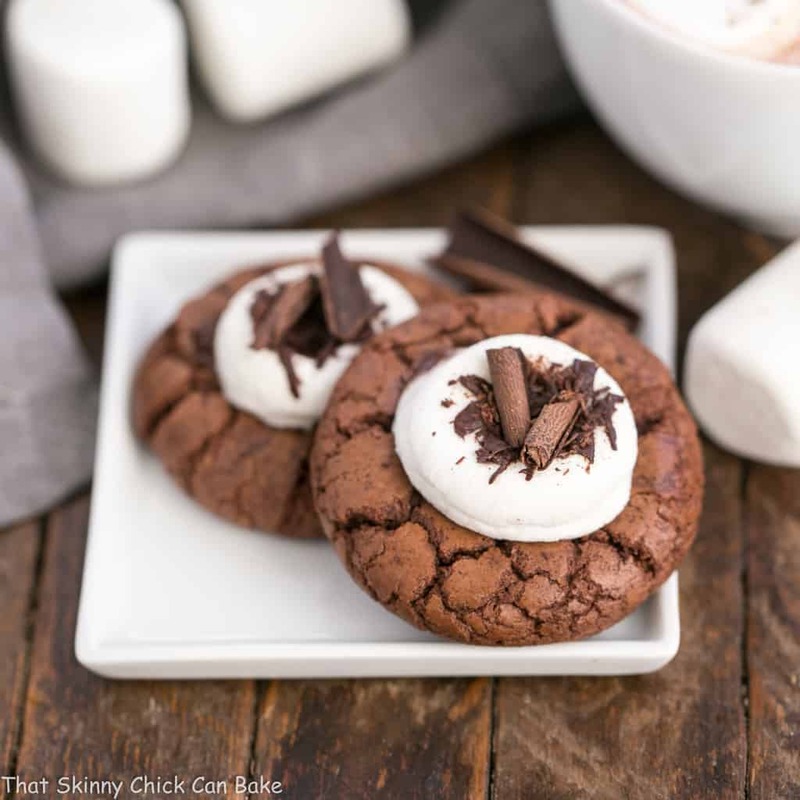 This is what fall desserts are made for!! Perfection! I made this for a Halloween party last night and it was the first dessert to go!